A serendipitous detection of the organic molecule methanol around an intriguing moon of Saturn suggests that material spewed from Enceladus undertakes a complex chemical journey once vented into space. This is the first time that a molecule from Enceladus has been detected with a ground-based telescope. Dr Emily Drabek-Maunder, of Cardiff University, presented the results on Tuesday 4 July at the National Astronomy Meeting at the University of Hull. Enceladus’s plumes are thought to originate in water escaping from a subsurface ocean through cracks in the moon’s icy surface. 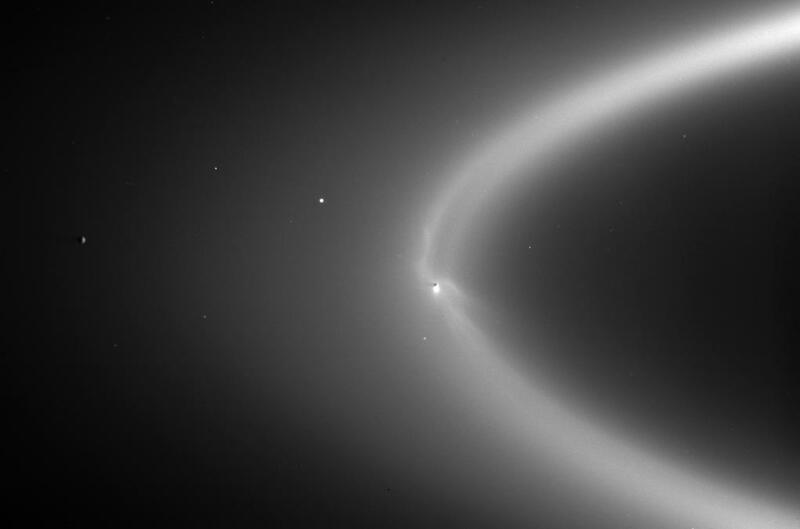 Eventually these plumes feed into Saturn’s second-outermost ring, the E-ring. Past studies of Enceladus have involved the NASA/ESA Cassini spacecraft, which has detected molecules like methanol by directly flying into the plumes. Recent work has found similar amounts of methanol in Earth’s oceans and Enceladus’s plumes. In this study, Dr Jane Greaves of Cardiff University and Dr Helen Fraser of the Open University detected the bright methanol signature using the IRAM 30-metre radio telescope in the Spanish Sierra Nevada. “This observation was very surprising since it was not the main molecule we were originally looking for in Enceladus’s plumes,” says Greaves. The team suggests the unexpectedly large quantity of methanol may have two possible origins: either a cloud of gas expelled from Enceladus has been trapped by Saturn’s magnetic field, or gas has spread further out into Saturn’s E-ring. In either case, the methanol has been greatly enhanced compared to detections in the plumes. 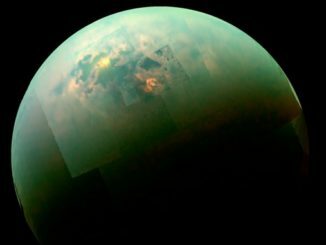 Cassini will end its journey later this year, leaving remote observations through ground- and space-based telescopes as the only possibility for exploring Saturn and its moons – at least for now. When 252P/LINEAR passed just 14 lunar distances from Earth on 21 March, the comet was galloping across the far southern sky at a rate of almost ten degrees per day. Now rapidly heading north, 252P finally appears in the predawn UK sky. 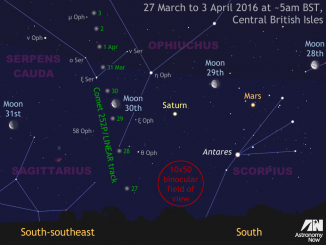 While moonlight will interfere with current observations, the comet is much brighter than predicted. 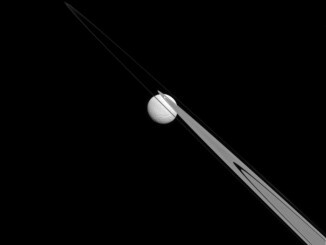 Like a drop of dew hanging on a leaf, Saturn’s moon Tethys appears to be stuck to the planet’s A and F rings in this view from the Cassini probe.